Insurance Company is Denying My Bike Accident Claim. Now What? Home » The Law & You » The Insurance Company is Denying My Bike Accident Claim. Now What? The Insurance Company is Denying My Bike Accident Claim. Now What? A viewer broke his jaw after riding his bike into a car door. Now the insurance company is denying his claim. What can he do? Personal injury lawyers Greg Fellerman and Ed Ciarimboli have the solution. Dave Kuharchik: We’re talking about a bike-riding accident. Of course, it’s that time of the year. The warmer weather is here and so is our attorneys Greg Fellerman and Ed Ciarimboli from the virtual law center. Thanks for being here. Ed Ciarimboli: It’s interesting, on the way over, I saw probably three or four bicyclists. Everybody’s out now, they’re riding their bikes. Greg Fellerman: I rode my bike around the lake on Saturday. Ed: Always a lake reference. Dave: Pete in Kingston says, “I was riding my bike and a car opened his door directly into traffic. I hit the door and broke my jaw. The guy’s insurance company is denying the claim.” So what can Pete do in this scenario here? Ed: So Pete, we have two — not one — two of these exact same cases. One, right now, here locally and one in our Philadelphia office as well. They are very good cases. The individual, if they are opening their door into traffic, they have an obligation to make sure that when they’re opening their door that the traffic is clear for both pedestrians, cars, and bicycles. If you are traveling down the road, you have just as much right of way as an automobile and the individual who is on the side can’t just open their car and obstruct traffic. Again, be it a pedestrian, a car, or a bicyclist. So, you have a good case here. Greg: Yeah and it’s important that this time of year especially the drivers, the bicyclists all know the rules of the road. I mean, it’s important. Bikes have the same exact same rights as the cars. Bikes have to be respectful of the drivers when they have to get out of the way so the cars can go by. Lot of bike safety issues — make sure you wear your helmet, make sure you wear color. Ed: Oh, speaking of color, are you still wearing that one piece 1986 spandex outfit? Dave: Wasn’t sure what the biggest site was around the lake — Greg on the bike or Greg on the dock. 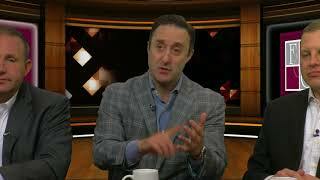 Dave: Don’t forget results matter with attorneys Greg Fellerman and Ed Ciarimboli. We’ll see you next time, guys.